Following his return from a visit to Erbil on 11 and 12 April, Cardinal Vincent spoke to the media about the plight of Christians in Northern Iraq. The Cardinal described how 125,000 people had arrived in Erbil overnight in August last year after fleeing from Islamic State forces. These people are now housed in converted shipping containers, called caravans, and rented accommodation paid for by the local Churches (Syrian, Chaldean and Orthodox Rites) and Church agencies such as Aid to the Church in Need. These caravans are located in ‘centres’, not ‘camps’ and those who are displaced are referred to as 'our relatives', not 'refugees', in an effort to extend help with dignity to those who have been displaced. 'This is help that's going to get them back up on their feet,' explained the Cardinal. The Cardinal said that he went to Iraq to show solidarity with Christians but that he 'came away full of admiration for those displaced people and the generosity and effective work of the Churches in Erbil.’ He described how Archbishop Warda has turned all of his Cathedral’s facilities and land into facilities to help people. He extended his gratitude and praise to local priests and religious who, having been driven out themselves, have accompanied the people and continue to work among them in the centres. The Cardinal commended their example as religious leaders who 'smell of the sheep’. During the visit, Cardinal Vincent also met the Syrian Orthodox Archbishop of Mosul who lost his 'cathedral, historic traditions of his faith, and manuscripts' in two hours as he and his community were driven out of the town. Despite being regularly sent photos of his cathedral being desecrated by IS forces, he remains resilient, preaching at the Orthodox Easter Vigil on 11 April on the need to be 'ready to build again, to go forward' once he and his community can return to Mosul. Cardinal Vincent was moved by the 'great trauma for families and Church communities'. He said it is 'impossible to meet especially the children without being determined that they must have a future'. An essential element of this future is education. Archbishop Warda is providing educational opportunities and has founded a school based on the International Baccalaureate, and there are plans to establish a university. The Archbishop hopes that this investment in the future will encourage Christians to stay in Iraq. In the process of rebuilding the cultural and regional heritage of the area in and around Mosul once IS are removed, the Cardinal stated that the presence of the Christian communities is ‘essential, not out of a nostalgic sense that this community is 2000 years old but as part of building a stable, balanced society in that region and I think that the Christian presence is essential to that mosaic’. The unique gift which Christians can contribute to the rebuilding of the Middle East is a 'deep, profound commitment to forgiveness and reconciliation', which is essential to building a 'stable fabric for the future'. 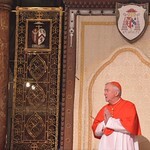 For more of the Cardinal's media from the Iraq trip, please click HERE.